Creating an Illinois Geography Lapbook can help you to further explore the wonderful state of Illinois. Basic instructions on creating a lapbook are available at the bottom of this page along with a PDF file including the information on this page and more. Geography is more than just the physical make up of a location, it is also about the people, their interaction with the environment and nature. I hope to have touched on each of these in some way in this lapbook study. You will find many facts and interesting items on this page and on the Illinois Geography page. There is too much information to include in a beginning lapbook session. Take a few minutes to first pick what you feel is important for your student to know or what might be interesting to him or her. I recommend no more than one or two items from each category per lapbooking session. The option to expand on this topic is always there but cover what you believe is important first. Do activities that relate to the topic, for example the State dance is a Square Dance. Look up online the basic Square Dance steps and try them or take a Square Dancing class. Follow up by putting a dance diagram in the lapbook. Be creative in trying new things and experiment with more than the templates. If your child is artistic, let her/him draw. If your child learns by hands-on activities make an invention. Is your child musically inclined, sing the state song. Is your child a writer, create a poem using the state facts or write about one or two of the famous people. Don't make this all about cutting and pasting facts and putting them in neat little flap books. Decorate, experiment, research interesting people and places in books from the library or online. Additionally, if you live in Illinois go outside see if you can find the state tree, bird or flower. If you don't live in Illinois, go outside and see how much your state/country has in common with Illinois. The northeastern border of Illinois is Lake Michigan. Its eastern border is Indiana. Its northern border is Wisconsin. Its western border with Missouri and Iowa is the Mississippi River. Its southern border with Kentucky is the Ohio River. Illinois also borders Michigan, but only via a water boundary in Lake Michigan. Illinois lies entirely in the Interior Plains. It has three major geographical divisions. The first is Northern Illinois including the city of Chicago, its suburbs, and the adjoining exurban area. The second is Central Illinois including Springfield. It is mostly flat prairie and is known as the Heart of Illinois. The third division is Southern Illinois. The juncture of the Mississippi River and the Ohio forms an area known as Little Egypt. This area has a warmer, humid climate and the landscape is rougher. from various tribes who lived in the region. Nickname for State: The Prairie State. and pick one or two and research them online. Find pictures and interesting facts and include them in your lapbook. If you need a template, check here. A home of Robert S. Abbott, founder of the Chicago Defender newspaper. Building designed by Dankmar Adler and Louis Sullivan. Historic district of Swedish dissident commune founded in 1846. Largest archaeological site related to Mississippian culture. Louis Sullivan AND Frank Lloyd Wright got in on this one's design. Skyscraper designed by Holabird & Root, housed the world's largest trading floor when built in 1930. A church dating from 1799. Part of the Chicago Park District. Home of Nobel-prize-winning physicist who proved light has both wave and particle aspects, the Compton Effect. An elementary school designed by Larry Perkins and Eliel Saarinen. Model for the now-widespread Winnetka Plan school design. A Frank Lloyd Wright-designed house. Home of David Davis (Supreme Court justice). Home of Charles Gates Dawes, architect of peace plans. A combined road and railway bridge which was, when completed in 1874, the longest arch bridge in the world. Site of exposed geological strata. A one-room home designed by Ludwig Mies van der Rohe. French fort built in 1720. Its powder magazine is believed to be oldest standing building in Illinois. An area originally established as a United States Army Post. A lighthouse on the shores of Lake Michigan, built in 1873 the wake of several shipping disasters. Designed by Chicago architect William W. Boyington for a partner in a nearby zinc company. Frank Lloyd Wright-designed house, his first fully in Prairie School style. One of the first settlement houses in the U.S. The home of Robert Kennicott, an American naturalist. Former home of embryologist Frank R. Lillie. An example of Prairie School landscape architecture designed by Alfred Caldwell. Home of abolitionist who was killed defending his printing presses. Home of Robert A. Millikan, a physicist. The former warehouse and offices of the national headquarters of one of the nations first mail order companies, Montgomery Ward. Best-preserved site of one of the Lincoln-Douglas debates. Entrance to the famous Union Stock Yards; designed by John Wellboorn Root. Another historic district of the Pullman Company including the Hotel Florence. Planned community designed by Frederick Law Olmsted and Calvert Vaux. A Prairie style home designed by Frank Lloyd Wright in 1908. The laboratory that first isolated plutonium and determined its atomic mass. Former home of civil rights advocate Ida B. Wells. Former home of temperance reformer Frances Willard, and longtime headquarters of the Woman's Christian Temperance Union. The former home of Dr. Daniel Hale Williams, one of the first major African American surgeons. Try to find an example of one or two of these. To get you started one arch is Illinois is the Pomona Bridge. There are a lot of lakes if you would like an easy one to expore. Learning about famous people from your state is a great way to tap into your student's interests. Studying famous authors or inventors from the list might spark a new passion. Have your student pick from the lists below and let them research that person and find 2 or 3 interesting facts about that person. Try to make sure they answer, "Why is this person famous?" Put those facts on a Fact Box template. Label the top flap Did You Know and on the inside put the interesting fact. Then put it in your Illinios geography lapbook. Go to the library or search online for information about one or two sites of interest to your child. Have them draw a picture, write a story, create a game and choose one or two items to condense into a form to fit in your Illinois Geography lapbook. There are no other National Park Service units in Illinois. Plants and animals are an important part of life. Include in your Illinois Geography lapbook a few plants and animals from Illinois. Wikimedia offers many images in the public domain that are copyright use acceptable. If you choose to include this information, I would suggest using the Vocabulary list template. Label the outside with the position i.e. Governor and the inside with who it is i.e. Rod Blagojevich. 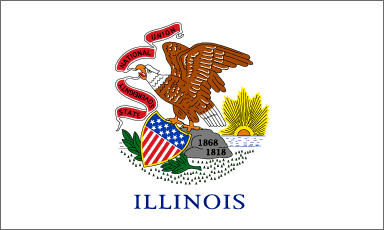 Illinois is one of the fifty states of the United States of America. It is divided into 102 counties. The counties contain cities, rural areas and towns. The PDF file will include a county map of Illinois that can be labeled with the counties, cities, and capital if desired. On the Illinois Geography page you will find a list of fun festivals and places to visit in Illinois. On the bottom of the Illinois Geography page is a place where others have created a page about their favorite places in Illinois. I encourage you to read their messages and comment on them and if you have been to an interesting or fun place make a page about your adventure. It is easy and fun to do. Illinois has a variety of protected areas including 123 state protected areas - state parks, wildlife areas, recreation areas, natural areas and state forests. There is one national forest, the Shawnee National Forest. Illinois has a wide climate range. Most of Illinois has hot, humid summers and cool to cold winters. The southernmost part of the state, from about Carbondale southward has more moderate winters. Average yearly precipitation for Illinois varies from just over 48 inches (1,220 mm) at the southern tip to around 35 inches (890 mm) in the northern portion of the state. Normal annual snowfall exceeds 38 inches (96 cm) in the Chicago area, while the southern portion of the state normally receives less than 14 inches (35 cm). The highest temperature recorded in Illinois was 117 °F (47 °C), recorded on July 14, 1954, at East St. Louis. The lowest temperature was -36 °F (-38 °C), recorded on January 5, 1999, at Congerville. Illinois averages around 50 days of thunderstorm activity a year. Illinois has an average of 35 tornadoes occurring annually. The deadliest tornado on record in the nation occurred largely in Illinois. The Tri-State Tornado of 1925 killed 695 people in three states; 613 of the victims lived in Illinois. Illinois Geography Lapbook Challenge: Make a weather comparison chart between either Chicago and Metropolis or with your state and include it in your Illinois Geography lapbook. The words were written by C.H. Chamberlain. For a printable version of this lapbook along with copies of the suggested templates, click here. Go from Illinois Geography Lapbook to Resources 4 Homeschoolers homepage.